The 7th edition of the Smile for the Camera Carnival, hosted by footnoteMaven on the Shades of the Departed blog, is Stocking Stuffer - show us that picture that would make a great Stocking Stuffer and tell us whose stocking you'd stuff. This was the "Davy Crockett year" when my brother Stan and I received Davy Crockett coonskin caps, a Davy Crockett book, and Daisy BB Gun air rifles. The persons in back of Stan and me are my grandfather (Lyle Carringer), my mother (Betty (Carringer) Seaver, and my father (Frederick w. Seaver). My grandmother, Emily (Auble) Carringer probably took this picture. I would like to gift this to my brother, Stanley. 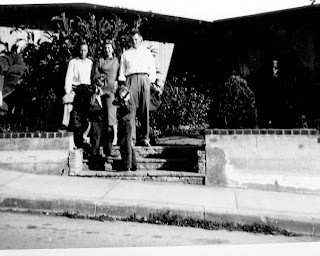 I need to make a higher quality scan of this picture and perhaps one other photo showing the faces of the family in 1954. I wonder in which album or box the photographs are? Genealogy Metrics - does it have your number? Blog Caroling - "Angels We Have Heard on High"